Over the last couple of weeks, there seems to be a fair amount of volatility in the SERP Trackers that require comment. It first started around the 16th December and continued until the 31st December. Despite the HTTPS update explaining some of the movement in the SERP Trackers, Google has also confirmed a continuation of the 19th November Update as a cause. Published: Jan 4, 2016. 12:47 +0100. It is not Penguin — John Mueller, webmaster trends analyst at Google, confirmed in early December that the new Real-time Google Penguin Algorithm would not be rolled out until 2016. Secondly, Google Panda was only recently (a few months ago) rolled out, and no chatter around the web indicates it is related to it. That being said, it is still possible that the update is Content Quality related, similar to the update of the 19th November 2015. Thirdly, Google changed how it indexed websites that have both HTTP and HTTPS URLs available. By default, Google will now index the HTTPS URL. With HTTPS giving an SEO boost, this may explain some of the volatility shown in the SERP trackers. Looking at the SERP Trackers enable us to see how large \ significant any Google Updates are. The Rank Risk Index shows some significant volatility commencing on the 16th December 2015 and continuing all the way through to the end of 2015. The first spike in volatility is partially explained by Google starting to rank HTTPS URLs as a priority to the normal HTTP ones. It is possible this is the cause of the volatility throughout as Google recrawls the web over time. MozCast gives quite a different picture to the Rank Risk Index. The only real spike is on the 12th December 2015, with the remainder of the month being fairly calm. This doesn’t quite make sense, but one possibility could be due to how MozCast interprets the HTTPS changes. If so, it could indicate a lack of any Google Update and more a simple change in the amount of HTTPS URL’s being indexed. Algaroo occupies the middle ground between the Rank Risk Index and MozCast. Volatility clearly starts on the 16th December 2015 with the HTTPS Update and continues until around the 24th December 2015. 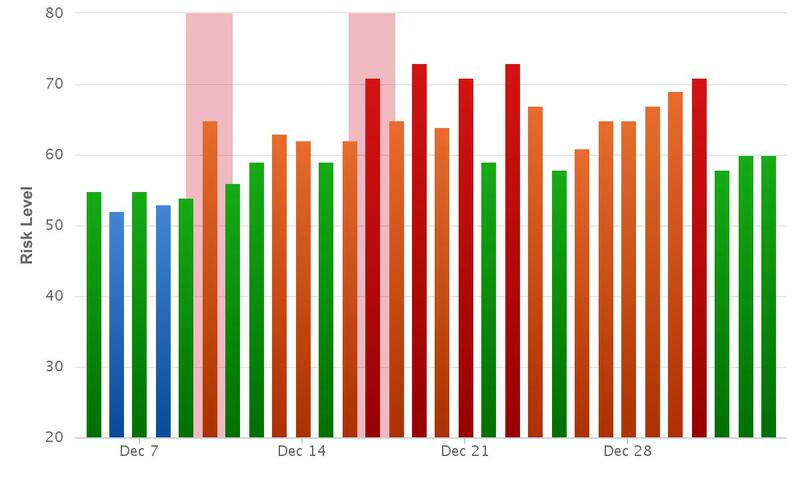 The SERP volatility is relatively quiet for the last week of 2015. What have webmasters been saying around the Web? The main discussions have been ongoing at Webmasterworld.com, with many webmasters reporting initial changes around the 14-16th December, and then again around the 29th — 30th December 2015. Without more widespread complaints, and with the HTTPS update and the usual reduction in traffic over the Christmas period it is tough to narrow down any possible cause based on these comments. @rustybrick @Marie_Haynes Tremors connected w/the 11/19 update have been continuous. I have seen more movement this week on sites impacted. The November update was Core Algorithm change, which many people at that time mentioned content quality as a possible impacting factor. We, therefore, suspect that the SERP trackers were showing volatility due to two things, the continuation of the November update, and the changes to HTTPS indexing.